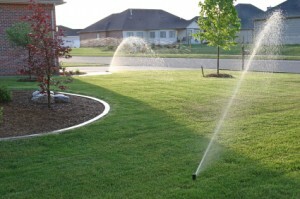 A quite stationary pop up style mist sprinkler used to water smaller and more intricate areas of the yard. Usually a good choice for watering various planting beds. Normally used to water areas less than 15 feet. Although we use some Rain Bird mist heads for a few specific applications, Toro is our mist head product of choice. Toro offers a large selection of water efficient nozzle choices for versatility and factory or on site installation of internal body parts to help reduce lost water caused by damage to the sprinkler head or low head drainage.